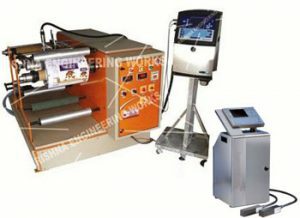 Inkjet Batch Coding Machine manufacturers, suppliers and exporters in Inkjet Coder Mounting Machine, in any paper, film and foil conversing industries, the Winder/Rewinder (Doctor Machine) is used widely for on-line printing of Mfg. Dt., Exp. Dt. B. No. etc. using Ink- jet printer or other contact coding machines from Roll to Roll at high speeds & then these printed roll are used in various packaging machines. our Winding Rewinding Machine for Inkjet Printing Machine. Inkjet Printers are widely used for Printing of Mfg.It is the standard for high throughput coding applications in production environments around the world.